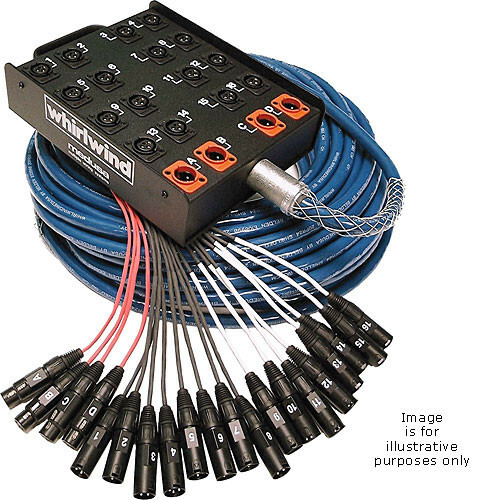 This Whirlwind Medusa Standard Series 20 Channel (0x Return) Snake is a snake cable with a heavy-duty steel stagebox at one end and a fanout at the other end. The cabling consists of heavy-duty, flexible Belden CM rated multipair cable. Each pair contains two twisted 24GA 7x32 polyethylene insulated conductors with 100% foil shield and 24GA drain wire. The fanouts feature genuine Whirlwind connectors. Mic channels are numbered and return connectors are lettered by engraving the metal barrel with large, easy to read graphics. Heavy-duty powder coated steel stagebox with Whirlwind connectors. Genuine Kellems wire mesh hanger to support the fanout at the board. Genuine Kellems strain relief and grip with internal cable clamp. Box Dimensions (LxWxH) 18.0 x 18.0 x 9.0"